PT Bank Rakyat Indonesia Agroniaga Tbk - Bank BRI AGRO or widely known as "BRI AGRO" is a well-established public-listed bank in Indonesia under PT Bank Rakyat Indonesia (Persero) Tbk (BRI Group). BRI Group - the second largest state-owned banks in Indonesia - holds 87.23% shares in BRI AGRO as at the end of September 2016. Other remaining shares in BRI AGRO was owned by DAPENBUN (9.10%), and general public (3.67%). Headquartered in Jakarta, BRI AGRO has strong business focus on agribusiness segment. BRI AGRO now has 17 branch offices, 16 sub branch offices, 4 cash offices, and directly employs nearly 592 staff. In term of financial positions, the Bank posted a positive financial result in the 3rd quarter of 2016 (3Q 2016, ended in 30 September 2016). 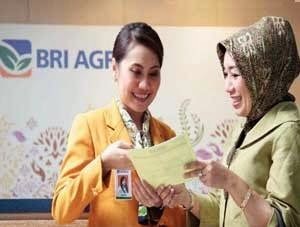 BRI AGRO booked total assets of Rp 10,442.61 billion in 3Q 2016, according to PT Bank Rakyat Indonesia Agroniaga Tbk Financial Report 3Q 2016 as cited by JobsCDC.com. This total assets figures reflected an 24.84% increase from Rp 8,364.50 billion in the previous year (3Q 2015). Total net profit for the year booked a 54.80% growth, reaching Rp 82.10 billion from Rp 53.03 billion in the same period at previous year. Background in Diploma Degree (D3) with minimum GPA of 2.75 (scale of 4.00). Freshgraduate or maximum 1 year working experience. Minimum height of 155 cm (Female) or 165 cm (Male) with proportional weight. Computer literate (minimum Microsoft Office and Excel). Placement at Jabodetabek and Cikarang. Oriented to target and customer satisfaction. Background in Diploma Degree (D3) with minimum GPA of 2.75 (scale of 4.00), majoring in Economics, Accounting, Management, Banking. Have a good knowledge about basic accounting and financial statements. Minimum Bachelor Degree (S1) with minimum GPA of 2.75 (scale of 4.00), majoring in Informatics Engineering, Computer Engineering. Preferably for those who have experience or develop application programs. Expertise with web based/database concept programming language. Familiar with operating system server, email server (install, setting and configuration). JobsCDC.com now available on android device. Download now on Google Play here. Please be aware of recruitment fraud. The entire stage of this selection process is free of charge. Bank BRI AGRO - D3, S1 Fresh Graduate, Experienced Staff BRI Group November 2016 will never ask for fees or upfront payments for any purposes during the recruitment process such as transportation and accommodation.